The Amen Clinic, according to the official website, is different since it focuses on the health of your brain and your quality of life, effectively learning how your brain functions. How much does the Amen Clinic cost? According to ScienceBasedMedicine.org, Amen charges patients $3,500+ without any insurance coverage to take a SPECT (Single Photon Emission Computed Tomography) scan, a scan which uses an injected radioisotope to help measure the blood flow in different areas of the brain to aid in the diagnosis and treatment of various conditions such as ADHD, depression, anxiety and dementia, to name a few. The Washington Post also confirmed the $3,500 price tag for a full initial session, which would include two SPECT scans. A recent Yelp.com review for the Costa Mesa, California, location, however, noted a 30-minute appointment will cost $225, but in the end, three counseling sessions and tests could be closer to $5,000 in total. With hundreds of reviews, it’s apparent that everyone who does visit the clinic will experience different price points, but it’s best to budget at least $3,000 to $5,000+ and be prepared to spend $250+ for future follow-up appointments every six months based on what we researched. For a phone consultation, before you begin treatment, they are available at $200 for up to 30 minutes or $400 for up to 60 minutes as per the official FAQ. As for follow-up visits after the initial scan has been performed, the company, as per the website, notes a 30-minute follow-up visit, via in-person or over the phone, can cost $200 per half session with the doctor or $125 per half session with one of the nurse practitioners or physician’s assistants. This fee would include the visit and the writing of reports/letters. These follow-up visits will depend upon your needs such as changing your medications or to simply follow up every six months. For insurance coverage, SPECT studies, in some cases, may cover the scans, but this will all depend on your policy restrictions. The Amen Clinics, however, will not bill the insurance companies, meaning you will be given a “walk-out statement,” containing the applicable diagnosis and billing codes, which can then be submitted on your own to your insurance company for any possible out-of-network reimbursements. To know if a SPECT study will be performed, you will want to first talk with the clinic to receive a CPT code and then call your insurance company to see what you will be responsible for if you were to use an out-of-network provider. 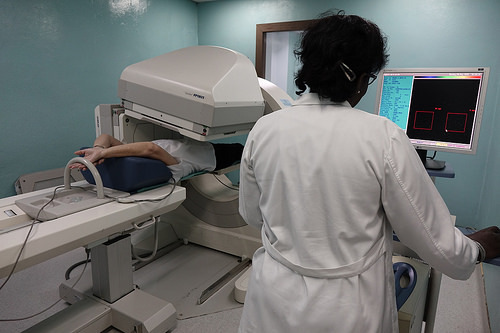 The chain of Amen Clinics primarily uses SPECT imaging, which is a nuclear medicine procedure designed to help study parts of the body such as the brain, bones, liver, heart and thyroid. This imaging scan can help the doctor study your blood flow and activity patterns of your brain. The entire purpose, as per the website, is said to be a reliable and proven method to measure the brain blood flow and activity, making it a primary tool used at the clinics to help evaluate and treat conditions related to the brain due to the patterns of activity noted in the scan as the scan can help their physicians observe three primary things: the areas of the brain that are working well; the areas of the brain which are working too hard; and the areas of the brain that are not working hard enough. Aside from SPECT imaging, they clinic also uses two neuropsychological tests, Conner’s Continuous Performance Test-II and WebNeuro, to help offer the physicians details on how your brain is working. The Conner’s Continuous Performance Test-II, for instance, helps assess response speed, impulse speed, and focus, whereas the WebNeuro test can help measure the function in emotion, self-regulation and feeling. If your hormones are deemed out of balance or your mental clarity seems to be out of balance as well, then additional lab tests may be necessary as well. Using the recommended tests above, physicians can then determine a unique targeted treatment plan, which can include medications, nutritional supplements, psychoterapy, medication and more. As everyone will be unique, no treatment plan will be the same. For the complete evaluation process, from start to finish, the company recommends you allow two to three days, spending upwards of three hours each day. Due to Dr. Amen’s research and teaching duties, patients will not be able to see Dr. Amen personally but are assured all physicians at the clinic have been trained by Dr. Amen. As of today, the clinics offer eight locations in Atlanta, Chicago, New York, Washington state, California and Washington D.C. The Amen Clinics have been highly criticized if researched online and while the results are mixed, it’s up to you to make a logical decision. The official website, for example, lists multiple peer-reviewed studies in regards to SPECT studies, whereas Sciencebasedmedicine.org criticizes the method.